How to clean the chair mats? Chair mats always come handy to protect the most expensive and amazingly beautiful floors we have in offices or homes. The perfect carpets that match the best of our interiors hence sometimes even adding to the interiors. Chair mats can help you protect the wear and tears to your carpets or the slid marks on your hard floors. Some of the chair mats even can reduce the sounds hence, they can act as a good sound absorbent. It is perfect to have chair mats for your places because it comes with great benefits. However, chair mats after a while might smell or get dirty due to the constant usage. If you keep the chair mats in offices, due to regular stepping of shoes on them might bring dirt. Also, the dust from the atmosphere may just get settled on it if they are being used for longer durations. We come up with the method to help you out keep your chair mats last long just like new one. The chair mats might turn yellow due to the usage of them for a long time without a wash. Cleaning chair mats is a very easy task and could be performed by yourself or by anyone you could hire. All you need to know is how to do it perfectly. Here, we are, to help you out with the same. We have compiled the process into steps for you to easily follow them. Get some mild soap from the store, it could be the one you use for regularly washing your clothes or you can also have the once specially dedicated to clean the mats. Mix the mild soap with warm water. It is advisable to use warm water rather than cold water because cold water might just not be able to act on the stuck dirt very well. Avoid using hot water, this may lead to damage of your chair mat. The reason is that they are made of the polycarbonate materials, cannot bear very high temperatures. This is also one of the reasons it is advisable not to keep your chair mats at places where there is direct sunlight. Use a damp cloth to apply the soap solution on both sides of the mats. You can also use a small brush to do the cleaning but make sure that the brush is not very hard or doesn’t have poky ends. It might cause damage to your chair mats otherwise. Use a soft brush to clean the lower portion of the chair mat, especially if you have one with spikes at the lower portion to keep your mat in place. It is very necessary to remove the dirt that gets between the spikes of the mat. They lead to a foul smell later on. Once you are done removing all the dirt and applying soap, rinse off the soap along with dirt carefully. You should be careful about the pressure you use to throw water for rinsing, the water pressure should be low else the holding capacity of the mats may decrease. It is advisable to use warm water for doing this too. It is very necessary to dry the chair mat properly. If the chair mats don’t dry completely then they might stink or change color over the time. Also, one must take care that these chair mats shouldn’t be dried in sunlight. You should not hang the chair mats. Place the washed wet chair mats over a dry cloth. You should avoid putting the wet mats in drier. Once all the soaked water is off, you should keep the chair mats at least one day before you use them again. Clean the legs of the chair properly. You can use a dry and damp cloth with a little warm water and soap for the same. Remember that you should also clean all the dirt stuck in the chair wheels before placing the mats beneath them. You can use various brushes for doing this. Make sure that the carpet or the floor is clean enough. Once you place the chair mat, it will be days that the portion below them would be cleaned. So, make sure that you get it cleaned before placing the mat. Ensure that the mats have dried completely. Hurray!! The process is complete. You can now use the chair mats as before. Place the chair mats on their positions back. Make sure that the dust from their upper surface is at least removed regularly. This helps to reduce the duration needed between two consecutive washes. Just to help you out, you should ensure that the places where these chair mats are placed should not have very high temperatures. Neither they should have very low temperatures. Avoid using the mats in sunlight. Doing this leads to the inappropriate behavior of the mats. It as well reduces the life of the mats. Do you also end up missing the most important parts of our lives at times? And that too just cause you were sleeping? We gradually wish that this should not happen with us of course, but time doesn’t come back. Every morning we wish to wake up fresh yet on time. Alarms definitely play an important role. Some of us have a damn bad habit of snoozing the alarm clocks and we definitely end up sleeping more than what we could actually afford to. Here are some of the tips you could apply in general to reduce your sleeping hours and yet be fresh every morning and never miss an important stuff. Believe it or not, I myself have been a heavy sleeper who usually used the phrases “Just 15 more minutes”, “will be there in a moment”hi hand millions of excuses accompanying these phrases. Additionally, I missed out many moments of life. Also, I had a bad habit of getting myself indulged in technologies which are damn addictive and hence I used to sleep late and wake up later. Here are some of the tips you could apply in general to reduce your sleeping hours and yet be fresh every morning and never miss any important stuff. All of these methods are either scientifically tested or have been practically implemented. Ensure that you drink a lot of water every day before going to bed. This help keeps the body temperature proper and helps regulate your sleep. The body tends to relax once the body temperature is under control. Due to this the hours you spent sleeping extra to complete your leftover sleep shall be reduced. This is one of the major reasons for disturbed sleep and extended sleep. If you don’t pee before going to bed, some of us in our head would be worried about the possibility of peeing. Also, this disturbs the sleep. Today’s world brings in a lot of stress every day and hence our brain tends to over think a lot. While in bed, we close our eyes and think about the same stuff that happened with us throughout the day. 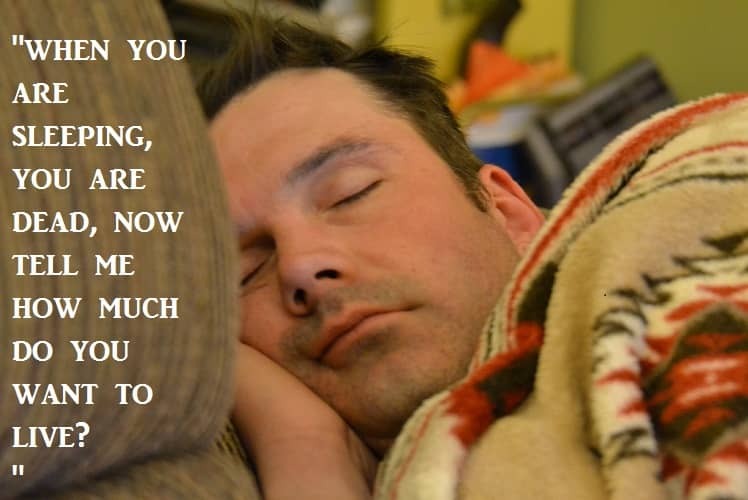 Hence we sleep way long after we could have slept. There is a very convenient solution to this. Maintain a diary and before going to bed empty your brain and sleep relaxed. This might sound an impossible task for us busy people but this definitely works. It has been a proven fact that in today’s technology-based world, most part of our brain is occupied by social media and the things running in the laptops and mobile phones. Reducing them definitely works. Sleeping with them is really harmful. The radiations which are imparted by these directly affect your brain and hence makes it more viable to being stressed. We occupy half of our time on these devices and sleep late. You can also avail medicinal help to your aid but that’s definitely the last option you should try. As we all know, medicines create a lot of harmful effects to your body and hence one should consume it as less as possible. Alarm clocks are the most conventional, effective and un failed means to wake up on time. Heavy sleepers need a perfect alarm clock for the same. A perfect alarm clock for any heavy sleeper would mean a clock which tells them time even at night, which keeps ringing unless they wake up, which has options of multiple alarms etc. Choose a perfect alarm clock for yourself from the list we provide. Although your phone’s serve as best alarm clocks for you but there definitely exist benefits of alarm clocks over cellphones. 1. Alarm clocks don’t radiate harmful radiations. 2. Cell phones are the addiction, alarm clocks can never be. 3. Using cell phones also enhances the possibilities of aging, alarm clocks are safer. 4. Alarm clocks are loud enough and also come with various alarm facilities. Rarely arises a case where we look for ourselves to put up plumbing tasks especially when we talk about installation of under sink water heaters, we really prefer some experts to do it. Installation is a tedious task. But there are very many types of equipment which don’t require any hard installation procedure and are very easy to install. One such amazing equipment is the under-sink instant water heater. 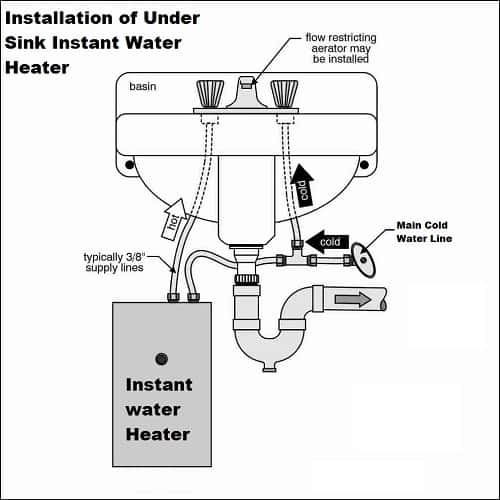 The installation procedure of the under-sink water heaters doesn’t require the hard plumbing techniques. You can do it yourself. Ah! Yes, that’s true! We have described the easiest and the most common method which is usually applicable to installing most of the under sink water heaters, but you first got to check yours. The under sink water heaters are the small heaters which usually fit under the sink and provide you the hot water in no time. Here’s the step-by-step procedure of how to install an under-sink water heater. First of all, before even beginning the installation, you should check if you have all the tool required handy or you need to get some. For this installation procedure, you are surely going to need a driller if you don’t have one, borrow or get one from a nearby shop. You need some screws(the number of these depends upon the type of water heater you are installing). Electric supply is must without a deny. It would be the best thing if you could arrange the installation instruction manual for your under sink instant water heater. Great! Once you are prepared, Don’t forget to check the size of the water heater and the space available under your sink, they should both complement each other. Ensure that you have cleaned the area around where you got to install a water heater. Also, make sure that the area is completely dry to avoid any kind of electric shock or risks. Check if you have already removed any kind of sprayers that might be or are attached to your sink’s hot water faucet. If not already done, take a moment to do it. Now, double check that you have closed all the valves related to the sink on which you are about to perform the installation task. Also, close all the faucets related. Again, make sure you have all the equipment. Check for everything. Identify the valve that serves the hot water to your sink. Also, identify the main valve which acts as the water supply for your sink. Identify the hoses that you are going to use to connect the valves and the heater. Once you are done with all the above-mentioned checkings, its time now to mount the under-sink instant water heater under your sink. Measure the distance between the holders provided behind the heater to mount the heater. Drill at the specific distance and put the screws. Hang it very carefully. Make sure that the heater is held intact, check it twice and thrice once you are done. After this check the hoses and measure them carefully. Make sure that they are perfect as per the required size. Once the heater is mounted well, the only task left is getting the connections done. Connect the main water supply to your sink to the inlet of the water heater. After this, connect the hot water delivering valve of the under-sink instant water heater to the faucet that you need the hot water from. Connect all the other pipes. Hurray! You are done. Remember you will have to wait! It takes time for the perfect things to happen. So sit back and have patience. Plug in the electric supply and wait for a while before using the most amazing under-sink instant water heater just now installed by you. After approximately half-an-hour of time after all the connections are set and the electric supply is done, you are ready to use the most perfect instant under sink water heaters to deliver you the instant water heaters in no time lapse. Turn on the tap and enjoy the perfect hot water just from the sink. Running the hot water from faucet for about 15 minutes, will remove the unwanted air bubbles from the tank. And, you should always remember that the hot water outlet will be depicted in red and the other one in Blue, just in case you miss the instruction manual somewhere and get confused out it. Do ensure that the electric power supply is turned off just before you start the installation process. Kindly check this twice. Do allow your sink’s faucet to be completely empty. This will ensure no leakage during the installation. Do use wrenches to fix the hoses. Don’t leave them loose at any time. This could be risky if hot water starts leaking at some point if hoses aren’t intact. Do close all the water supply valves related to the sink where you are installing the under sink water heater. Otherwise, you might accidentally get yourself soaked in water. This could lead to additional problems too. Do make sure that you connect the hoses properly and as per the mentioned directions. Else, you might end up misusing the heater, water, and electricity. Don’t be in hurry. Remember prevention is better than cure. Hence, never be in hurry. Take proper time and start installation only when you have sufficient 1 hour for the process. Do wait at least 1 hour after the installation process to use the heater. Do leave the faucet open for about 15-20 minutes just before using the under sink water heater to allow the air bubbles to get off the tank and smooth water supply. You should ensure that the temperature is set perfectly so that you don’t burn yourself. Do check for leakages and if there are any, it is better for you to cross-check the connections made and tighten them if any are loose. If you don’t find any fault, maybe your instant under-sink water heater has defects, call the customer care immediately. Consulting a professional is never a bad option in such cases. If there are any leakages, Don’t turn on the electric supply sooner. Installing the under sink water heater is a very easy task. The steps above are the simplest and accurately designed procedure for the common installation procedure. If you have a user manual for installation, kindly refer that prior to the procedure starting. You should also make sure that you have all the necessary materials required before-hand. DO it yourself, you will feel good. Key holders are the best items which you can use to organize your keys in the best possible ways. These best magnetic key holders are capable of holding your keys with a magnetic attraction, providing you the best solutions for forgetting your keys at any time. With a perfect magnetic attraction, these key holders serve you best to attach your keys very easily even in the moments of a hurry. The list under provides you with the 8 best magnetic key holders available in the market. You can choose the best for you. What are the features of magnetic key holders? Are magnetic keyholders better than normal key holders? The magnetic key holders come with magnets which avoids the use of hooks, that ensures that you never lose your keys. The magnetic effect of the key holder attracts your keys and you just need to put your keys near the key holders and they will attract them. Hence, if you are always in hurry these key holders are just the products you need to ensure that your keys are never missing. Magnetic keyholders also look more classy than classical key holders hence providing a smarter look to your interior. Are magnetic keyholders better than the normal key holders? Definitely, every product comes with pros and cons together. This is the same with magnetic keyholders. The advantages it has over normal keyholders include the strong magnets which attract your keys anytime anywhere. These are small enough to be kept anywhere and they are usually sticky to metallic surfaces or comes with adhesive backing hence allowing an easy installation. How many keys can a magnetic key holder hold? Magnetic key holders come with different capacities but they usually are capable of holding a few keys say up to 5-6 keys. But there are key holders which come in the package like the one from Tescat which offers you 6 pieces of the product to ensure that you never miss any key. Brooklyn Basix wall-mount organizer simply helps you to keep your daily carry essentials organized within reach as you enter your house. It has 5 strong magnetic discs to hold 5 different sets of keys. The capacity of each disc is 2lbs. Effectively, it is 100 percent eco-friendly. Brooklyn uses plantation hardwood to create these unique magnetic key holders. These are available in two stain finishes which makes it more great for usage as per your interiors. The dimensions of 12″L x 4″H x 4” D are perfect along with the wall-mounting hardware which the package includes. Moreover, Brooklyn also provides five magnetic key rings of 1″ diameter each. You can use these key rings in case you have those rings which are not magnetic. These very strong embedded neodymium magnets are able to accommodate up to 5 keys. Additionally, the utilitarian shelf provided in the keyholders houses your wallet, phone, money clip, sunglasses, bills, emails, etc. So you never have to worry about missing anything with these perfect key holders. You can use this shelf to keep all the things that you take to the office or work at a single place. Finally, if you are a person who wants to keep all the important stuff together, these key-holders from Brooklyn will definitely serve you the best. It has the utilitarian shelf. The color may create an issue. Can hold 5 bunches of keys. The Magnetic Key-Holder by Umbra is a wall-mount key organizer with a clever design which can keep mail, keys, other essentials. 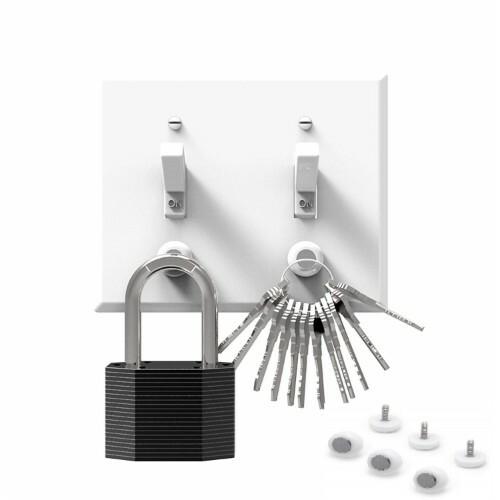 The keyholder includes strong and hidden magnetic strips which are capable of holding several key sets. The Umbra wall-mount magnetic key holder is available in three finishes: White, Espresso and Natural. You can choose among them suiting your house’s interiors. 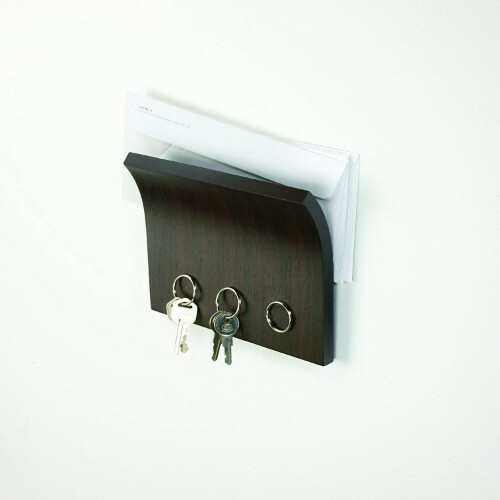 The package also includes hidden mounting hardware which is perfect to mount the key holders to your walls etc. Additionally, Umbra adds a strong and hidden magnetic strip along the lower half which easily holds many sets of keys. Also, a curved upper portion is designed. This upper portion serves as a holder for letters and other materials. These are capable of holding even car keys with alarm controls. The simple design by organizer blends into the surroundings. This key holder in addition to holding different keys is also capable of holding DVDs and other magnetic materials, without causing them any harm. Magnets could be stronger and bigger. The upper part can hold mails and other materials. The lower half can hold several keys. Peleg Design Magnetic Key Holder is a light-weight key holder capable of holding a key ring intact. 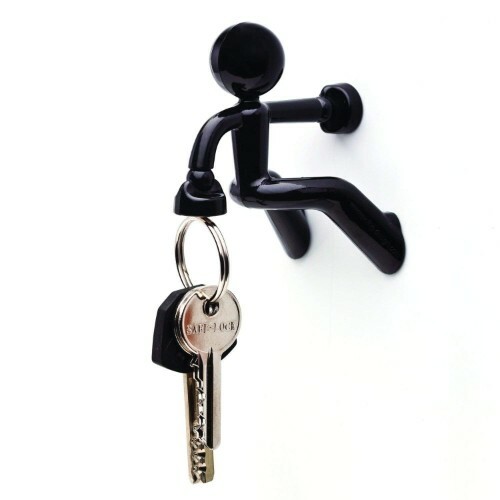 The Peleg Design includes a strong magnet in this unique key holder. This key holder can hold up to 30 keys. Uniquely, these keyholders from Peleg ensure attachment to all metallic doors. These are also capable of attracting fridge doors. Hence, you can hang them or fix them to your fridge doors also, just in case. They easily affix to any metallic surface hence you don’t need to worry about changing their positions at any point. Moreover, the dimensions of this keyholder are convenient enough for you to hold them anywhere around the house. And, is it your friend’s birthday? Is it your anniversary? or is it your cousin’s work anniversary? These keyholders being perfect for any age are perfect as gifts. This keyholder from Peleg Design is good to be used by people of all age groups. Can hold up to 30 keys. It might fall off vertically on overload. These key holders from Booyoom can help you keep all your stuff in one place. If you are a kind of person who enters his/her office or home and put all your keys? 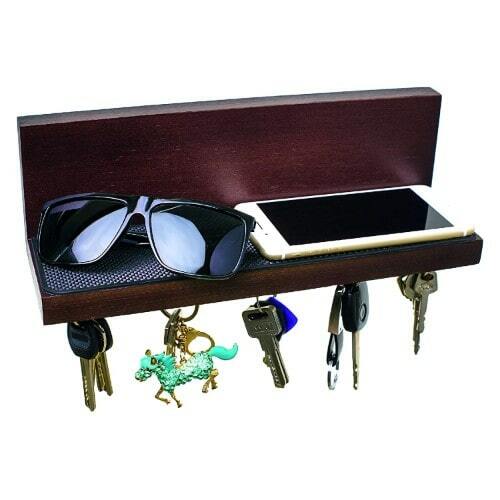 This key holder has a rack which is an incredible floating shelf that offers a separate space for your wallets, phones, and keys. It helps eliminate the clutter. This uplifts the aesthetic appeal of your interior by its perfect blend of wooden finish and attractive luster. Moreover, this key holder from Booyoom also has an anti-slip pad. This anti-slip pad eliminates the risk of damage, scratches to the valuables due to accidental slipping or dropping. It accommodates 5 strong magnets; each can hold up to 2 lbs. Additionally, Booyoom uses high-quality wood hence provides an eco-friendly solution. Easy to use, these products are highly durable. These key racks also offer versatile solutions to organize all your important stuff. This can also be used to attract tools, metallic accessories, and gadgets. In addition, Booyoom also provides you with the required installation hardware for your support. This will help you to mount the keyholder very easily. The best part includes the guarantee that the Booyoom offers. They ensure that all your keyrings effortlessly stick to the magnetic surface, they provide you with 5 keyrings. Booyoom offers 100% Risk-free guarantee, even on being sure of the quality checks and material durability. Comes with the anti-slip pad. 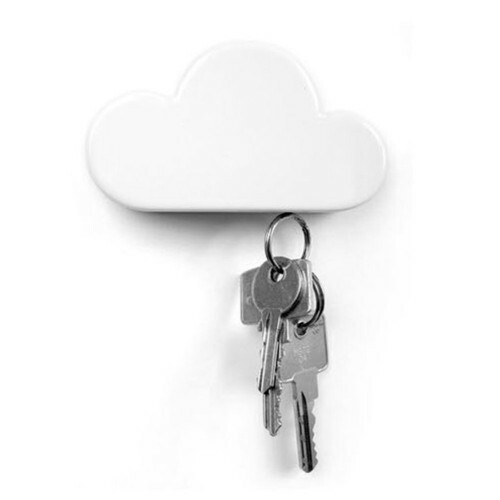 This keyholder from Twone has a unique design of a fluffy white cloud. It serves as a whimsical addition to your decor. It comes with no hooks, hence no hassles. This keyholder from Twone is incredibly simple to use. 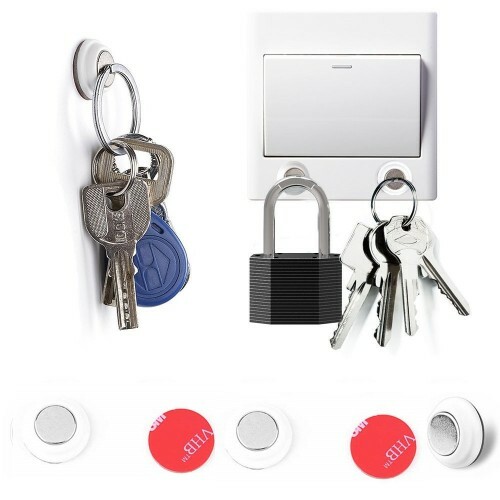 The powerful magnets included will help you to keep your keys in place. You will then never have to worry about losing your keys. Furthermore, Twone provides an adhesive backing to this amazing magnetic key holder. This key holder can be mount very well easily to any door, walls or anywhere, any surface, magnetic or non-magnetic. It will not stick to the metal surface by magnetic attraction but it will stick to any surface by the adhesive coating on its back. Additionally, it is capable of holding the bunch of keys which weigh a several pounds. It uses ABS plastic of very high quality which enhances its durability. Also, the Twone ensures strength and quality of the product by using the best material. 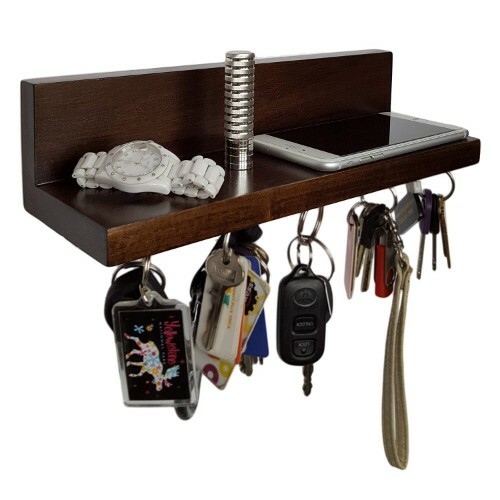 Capable of holding individual keys and also the bunch of keys held by a keyring, this product helps you to take care of all the stuff together. It can also hold pocket knives along with the other metallic things. The adhesive could be more sticky. This magnetic wall-mount key holder from WaldenTheory comes in various designs- stone, cloud, strip, rectangle and circular. You can choose according to your choice. 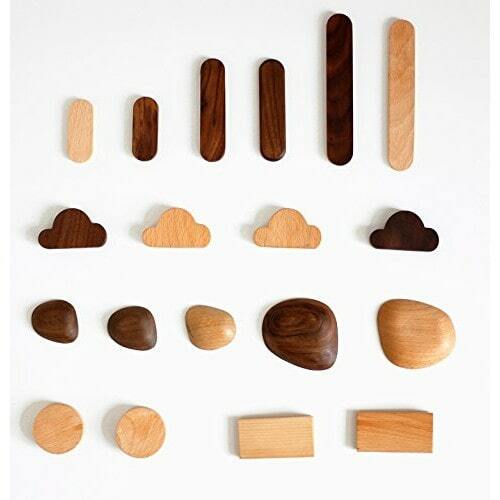 You can also choose from the walnut and the natural wood shades available for all the designs in any of the mentioned shapes. WaldenTheory provides you options to choose from the most stylish designs available. Your keys will simply stick to the key holder very easily, you will never have to worry about losing your keys after getting this key holder. It will ensure that your keys are in place. You can stick the key holder anywhere like your fridge door, any wall. Moreover, these key holders are eco-friendly, ensuring no harm to the environment. These use handcrafting with fresh wood. Plant wax oil is used to bound the keyholder. The Twone key holders are very strong and durable and can hold up to 2.64 lbs’ weight. Also, the WaldenTheory has set up a customer care which is always there for you 24X7. Hence, if you are not satisfied with the product, you can initiate easy returns and refund. This implies no loss of money. Can hold several keys together. The Tescat Magnetic key holder comes with a very easy installation procedure. Just peel off the 3M tape, stick it to any surface you want your key holder to be mounted on, and you are done. The easy anywhere installation allows you to have several keyholders everywhere in your house wherever you feel important. This allows you to never miss your keys, they will always be protected in attraction to your key holders. Tescat uses strong magnets for this keyholder which are strong enough to bear 3 pounds hence, you never have to worry about the load you put on the key holder. This also ensures that you don’t drop your keys and also that your keys don’t dangle. Additionally, you don’t have to buy several sets of keyholders; Tescat packs up 6 for you in one package, hence only one order for this magnetic keyholder is enough. In case, you find that you have been provided with the wrong installation, Tescat has found a better alternative to solve this problem for you. They provide you with 4 extra 3M adhesive tape pieces which can be used just in case of an emergency. Furthermore, this keyholder doesn’t just support keys. It also can hold any little material which is metallic. A cable, a knife, a tool, or just anything you just don’t want to lose. Bunch of keys might cause trouble. 6 keyholders in one set. The KeySmart Key catch magnetic key holder is a modern key rack which goes perfectly with your switches. You can definitely throw away your old dusty key racks once you see this key holder from KeySmart. You always have a switch for lights next to your doors, most likely you do have one near every door. These key holders will allow you to never lose your keys as they serve as light switches which are just next to your doors. In addition, KeySmart uses neodymium magnets to make these perfectly amazing magnetic keyholders. These magnets are strong enough to hold up to at least 3 pounds. Hence, you will never lose your keys just because of accidental slipping of your keys from your key racks. You never have to worry about calling a handyman to fix your keyholder to your walls or anywhere. All you have to do is replace the screw at the bottom of the light switch with this KeyCatch key holder and you are all set to organize your keys with this. Apart from the perfect and easy installation, KeySmart makes it sure that the magnets used are strong enough to hold your keys and accessories. But they are not capable to destroy any of your electronics. Hence, you can trust them. Can attach to a switchboard. Bulky keys may create a problem. Therefore in the end, after having a look at the top 8 best magnetic keyholders available. You will definitely find the one which is perfect for you and which will fulfill all your needs. How To Protect Carpet and Hard-floor From Rolling Chair? Do Rolling Chairs Damage Carpet? Yes, rolling chairs do damage carpet. 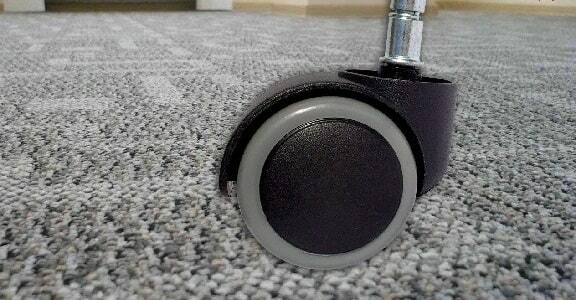 Sharp-edged rolling chair’s caster wheel can cause damage to your beautiful carpet. When you roll the chair on the carpet, the sharp edges of some caster wheels cut the pile on the carpet, this reduces the softness and life of the carpet. How To Protect Carpet From Damage By Rolling Chairs? Flooring adds a substantial value to your houses and offices, and rolling chair wheels damage these floors. To avoid these damages, you can use either rolling chairs with carpet friendly caster wheels or chair mats for carpet. The casters of many chairs are made up of low-quality materials that damage your expensive flooring. Some companies designed specific caster wheels to save the carpets. The floor friendly caster wheels are covered with rubber-like, polyurethane material which keeps the floors safe from the sharp edges. These casters come in two styles: roller-blade and traditional style. In rollerblade style, the caster wheels do not have any sharp edges and hence do not damage the carpet. These caster wheels roll very smoothly in minimum effort. These soft roller-blade tiers have high tear resistance and high tensile properties which makes them extremely durable. These casters have swivel head i.e. they allow rotation of 360 degrees. The swivel action depends on bearings, shapes of the wheels, and lubrication. Rollerblade-style casters have a single narrow circular surfaced wheel which is way easier to swivel then a traditional two-wheel caster. In rollerblade style, Office Oasis Caster Wheels are the best caster wheels. Whereas in traditional style, the caster has two wheels which are covered by polyurethane material which never harms hardwood floors, laminate, carpets, any tile, or slate. The rubber-like polyurethane covers the sharp edges of the wheel to prevent damage to the floors. It creates proper friction for rolling and prevents scratches on floors. These casters are also swivel-head type caster wheels, however, these are not as smooth as the rollerblade caster wheels because of the wider shape of two combined wheels. In traditional casters, Zitriom Office Chair Casters are best. Some people use chair mats (polycarbonate mats) to protect Their floors from wear and tear of the rolling chairs. Chair mats are clear, rigid mats that provide a smooth rolling surface for chairs on carpets and hardwood floors. Hard floors like hardwood floors, tile floors, concrete floors, etc can be protected by similar types of chair mat, but, if you are using carpets on your floor, then you need to use different types of the chair mat. You should use chair mats with spikes your carpets. 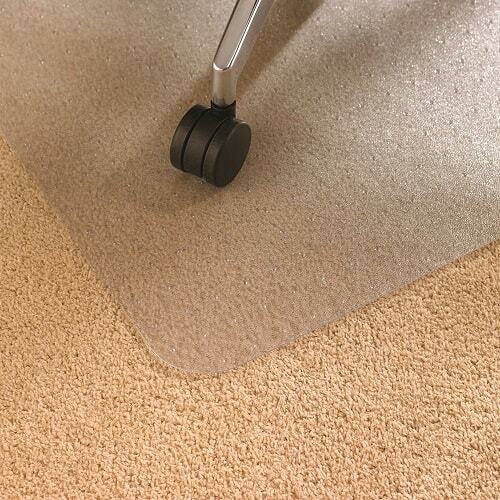 Carpets have piles and so it is not possible to use a textured surface to resist skidding. Spikes, on the other side, can help to keep the chair mat in its place because they are deep enough in the pile to hold the chair mat. The thickness of the mat also depends upon the size of the pile. If you have a pile carpeting on your floor with large piles then you will need a thick mat and if you have a carpet with small piles then you will need a thinner chair mat. You can choose your chair mat from best chair mats. You can use either of the solutions to keep your floor safe from wear and tear of rolling chair. If you are using office chair mats, then you do not need to use carpet friendly caster wheels; and if you are using carpet friendly caster wheels then there is no need of chair mats.